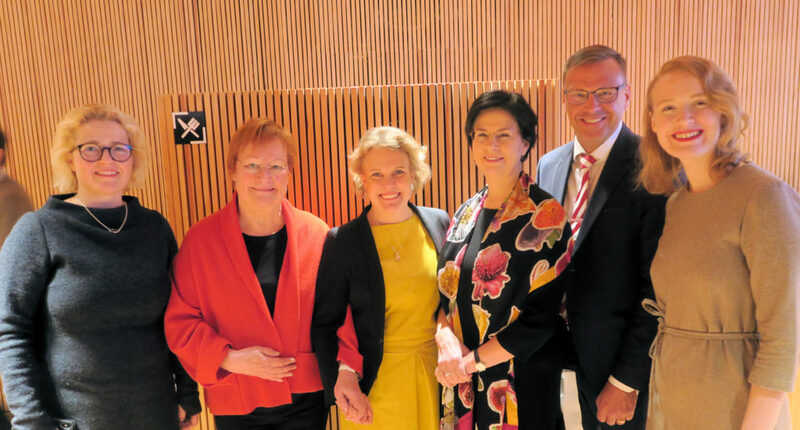 In the picture: MEP Miapetra Kumpula-Natri (left), President Tarja Halonen, Member of Parliament Pilvi Torsti, Permanent Secretary Anita Lehikoinen, Executive Director of Arene ry Petri Lempinen and Project manager in Workers’ Educational Association WEA of Finland Maria Mäkynen. The future higher education and science! -seminar brought together university representatives, ministry officials, academics and students into a dialogue for the future of science and education in Finland. At her speech President Halonen emphasized the importance of the discussion around these topics especially before the upcoming Parliamentary and European Elections. – The sustainable society needs science and research based policy making at all different levels. President Halonen stressed also the effects education has on society. – Finland’s triumph has been the high level of competence that begins with early childhood education and continues at its best throughout the life. – It goes without saying that the education and research are worth investing for. It is important to eliminate the structural inequality in education at every level starting from kindergarten. We cannot afford to lose anyone’s talents and our society works better when everyone can be involved. President Halonen encourages to take part in societal debate despite the downsides it has. – Thank you for coming here today. Clearly you have a fighting spirit to change the society towards better direction. The event was organised by The Social Democratic Party of Finland and Workers’ Educational Association WEA of Finland.